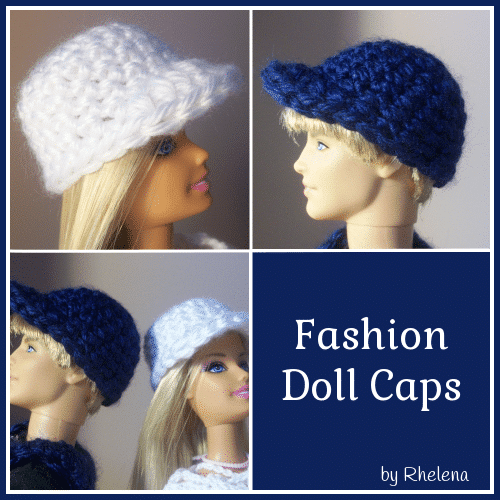 These fashion doll caps are for both Ken and Barbie. Both are basically the same, except that Ken’s is slightly larger than Barbie’s. Both can be worked up in a jiffy and are suitable for beginners. Although it’s the perfect barbie baseball cap, you can use this hat for a number of outfits that your child’s doll may have. The pattern is given for the small, special instructions for the larger cap are given in the parenthesis (). Material: Bernat Satin – medium worsted weight. If you are unsure of how to do any of these stitches, you can refer to this Crochet Abbreviation Chart. Ch 3, join with sl st to form circle. Rnd 8: Ch 1, sc in first 6 (7) sts, hdc in next st, 2 dc in next 4 sts, hdc in next st, sc in last 6 (7) sts. Join with sl st. Fasten off.